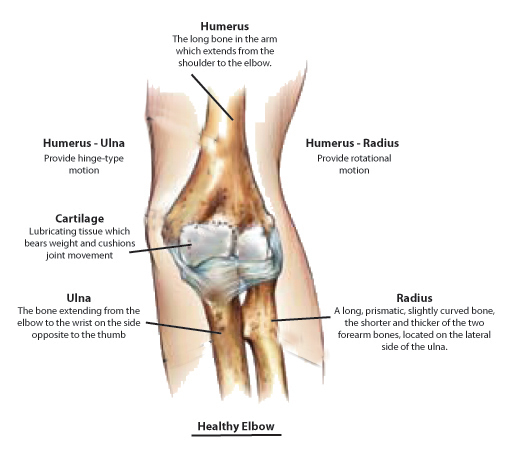 The elbow joint is made up of three bones: the humerus bone (upper-arm bone), the ulna (forearm bone on the little finger side), and the radius bone (forearm bone on the thumb side) which provide two types of motion. The ulna and the humerus meet at the elbow and form a hinge which allows the arm to bend and straighten. The humerus and the radius provide rotational motion. The tricep muscle in the back of the arm attaches to the ulna. When the muscle contracts it straightens the elbow. When the bicep muscle in the front of the arm contracts it bends the elbow. The joint surfaces are covered with a tough lubricating tissue called cartilage. Cartilage acts like a natural shock absorber, preventing both bone on bone contact and providing a smooth, pain-free surface for the bones to glide against.